With the news that the United States military will officially adopt the SIG Sauer P320 pistol to replace the Beretta M9 that has served since the 1980s, it would seem like an appropriate time to discuss SIGs in general. The manufacturer, SIG Sauer, is regarded as being a premium brand on the firearms market. Their products tend to be much more expensive than the counterparts released from other companies. In fact, it was only because SIG Sauer’s P226 was slightly higher priced than the Beretta 92FS that it was not chosen during the Army trials in the 80s. So yes, you will pay more for a SIG Sauer handgun (at least a new one). But at the same time, you will definitely get what you pay for. SIG pistols are made to the absolute highest quality and are designed to last. These are pistols that your descendants will continue passing down many years from now. Any SIG pistol is a superb choice for anything from home defense to concealed carry to a duty sidearm or even a simple range weapon. But what are the very best SIG pistols that you should consider? We’ll talk about five of them in what follows. The P220 was not the first pistol SIG Sauer released or even their first successful pistol (that honor goes to the P210), but it was the pistol that gained them worldwide attention and established them a slice of the marketplace in the United States. The P220 is a full size, single stack, DA/SA semi-automatic pistol with an all-steel frame and that is hammer fired. It was originally offered in both 9mm and .45 ACP, but new P220’s are now offered in just .45. There are many who consider the P220 to be the finest double action .45 ever produced, even today when many new models of .45’s have been produced. 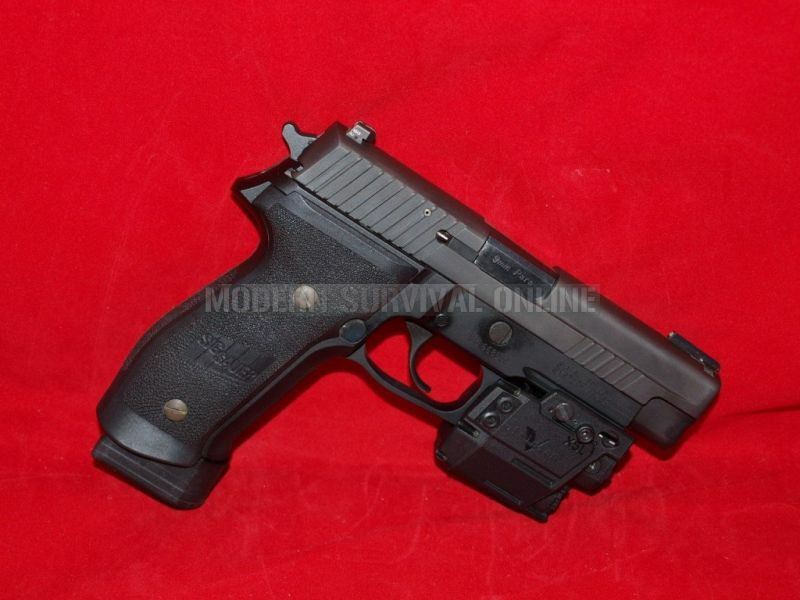 Releasing the P220, particularly into the United States, was not a riskless endeavor for SIG. At the time, the 1911 ruled the handgun market and was the pistol of choice for many civilians and police departments. But one significant factor that the 1911 had was that it was single action only, meaning the weapon could only fire when cocked. In contrast to this, the P220 has a long first trigger pull that also naturally acts as a safety. While the 1911 is designed to be carried cocked and locked (AKA hammer down with the safety on), it’s still not the safest way to do it, and generally not recommend for novice gun owners. A decocking lever on the side of the frame of the P220 is easily accessible and will return the pistol to double action after being fired. There are no manual safeties on the P220, which was a major innovation at the time of its release. The P220 has spawned an entire generation of pistols, with the most notable variants being the P225, P226, P227, P228, and P229. The SIG P229’s history began with the development of the P228. The story goes that SIG decided to manufacture a compact version of the P226 that would be better for concealment or for shooters with smaller hands. The P228 was the result of this, and it was adopted by the U.S Air Force as the M11 pistol as well as by numerous law enforcement agencies. SIG later updated the P228 to the P229 in order to handle the higher pressure .40 S&W and .357 SIG rounds. The only differences between the two weapons was in the slide (the P228 used a forged carbon slide while the P229’s is constructed out of stainless steel). SIG then decided to discontinue the P228, when they released they could just make the P229 in the 9mm caliber. So in essence, the P229 is a more compact version of the P226 and would be a better choice for you if concealment is an issue or if you have smaller hands. That being said, the P229 is still large enough to be used for duty use as well, and indeed remains in use with many military departments today. The P229 is available in 9mm, .40 S&W, or .357 SIG. As with the P226, only a change in barrels is needed to fire .40 or .357 in the same weapon. A true classic, the P226 is probably SIG’s most famous firearm. It quickly became world renowned right when it was released in the 1980s, and entered into the U.S Army’s trail. The United States was looking for a double stacked and double action 9mm auto to replace the aging Colt M1911A1 .45. SIG basically took a 9mm P220 and made it a double stack that held 15 rounds and the result was the P226. Other than that, the two weapons are virtually identical. The P226 made significant headway in the trials and eventually it came down between it and the Beretta 92. Regardless of which of the two pistols actually performed a little better, the Beretta was selected because it cost less than the SIG. While the Beretta is a fine and respectable weapon, there are many people who feel that the P226 was the pistol the U.S Military deserved. That being said, the Navy SEAL’s actually did select the P226 over the Beretta 92 (and continued to use it until recently when they replaced it with the Glock 19). The P226 is today available in 9mm, .40 S&W, and .357 SIG. The .40 and .357 SIG models are actually identical and you only need to swap the barrels when switching between calibers; even the magazines for the two weapons are the same. 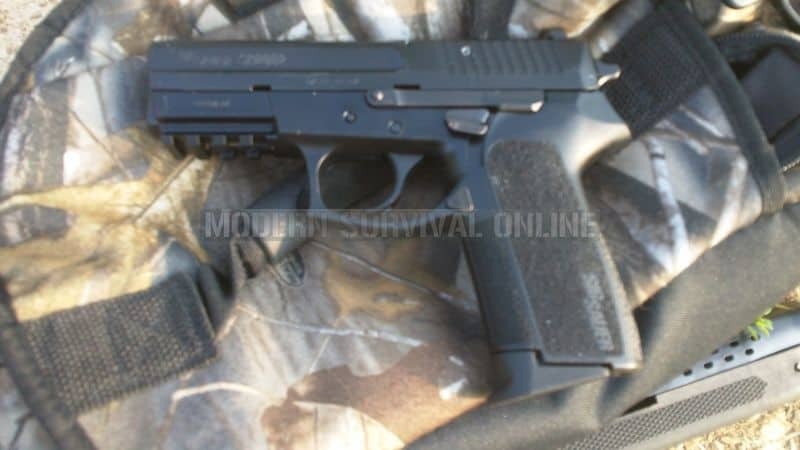 This means you can have a kit consisting of a P226, magazines, and two barrels and you’ll be able to fire two separate calibers, which could be a major advantage in an SHTF situation (as this essentially gives you two pistols in one). Countless variations of the P226 exist on the market today, with newer models all being released with an accessory rail for adding lights, lasers, or other accessories. The SP2022 is often known as the ‘poor man’s SIG.’ It was SIG’s very first polymer framed pistol and was marketed to those who could not afford the higher priced P226 or P229, while still not sacrificing quality. In the 2000s, the handgun market became increasingly competitive and budget minded, which led to the SP2022’s release. It remains an excellent though largely forgotten pistol today. Available in 9mm, .40 S&W, and .357 SIG, the main appeal of the SP2022 is that it is much lighter than the comparable P229. Despite this, the basic controls of the two weapons are the same. The SP2022 is also a DA/SA hammer fired pistols still features a slide release directly above the grip along with a decocking lever on the side of the frame. The SP2022 also has an accessory rail on the frame and interchangeable back straps; the early P229s did not have the former and still don’t have the latter even today. All in all, the SP2022 is a pistol that is still worth a look despite the fact that it has not been given as much notice as the P220-series or SIG’s more recent P320. Finally, we come to the P320, the latest in SIG pistol, a striker fired polymer framed pistol designed to compete primarily with the Glock, Smith & Wesson M&P, and the Springfield XD-series. But what makes the P320 stand out in general, and a primary factor that led to its adoption by the U.S Military (besides its reliability), is the fact that it is a fully modular handgun system. The weapon is very simple and only consists of the slide, frame, barrel, trigger assembly, and the magazine. You can then purchase multiple frames of the P320 while only keeping one slide, barrel, and trigger, essentially giving you a full size, mid size, and compact pistol all in one (you would only need to get a shorter magazine for the compact frame). The P320 will be designated the M17 in the U.S Army (which will incorporate a manual frame mounted safety) but will continue to be sold on the civilian market. The P320 isn’t just great if you want to own a striker fired SIG pistol. It’s also a great pistol to own if you want to alternate between different sizes without actually having to buy a new pistol. SIG Sauer has continued to set high standards in the firearms world and it’s easy to see why they have been so widely accepted by militaries, law enforcement units, and civilians all over the globe. These truly are premium pistols that are designed to endure many years of hard use. The five specific SIG models that we have covered in this article are their most popular ones on the marketplace today and the top five that you should consider if you are ever looking to purchase your very first SIG. IMHO Replace the SP2022 with the P400 or P227. I don’t see the P400 in the current online catalog but it is a superb AR pistol if a little heavy. Extremely well-made rugged and reliable. If the P400 is discontinued then I would place the P227 ahead of the SP2022 as well, double-stack .45 ACP only very slightly larger than a P227 … what’s not to like ? I shoot S&W .40’s. My first .40 was purchased in 1992, a model 4006, DA/SA. The first trigger pull is heavy, but after that, it’s feather light. It is single hole accurate! Heavy stainless steel but a beauty. My second .40 I purchased sometime around 2004. It’s the standard M&P model. Close to the same accuracy. I find the recoil a little more noticeable than the 4006 but it is a bit lighter to carry. I’ve always practiced with the 180 gr round but I’m working my way thru that inventory and converting to the 165 gr. practice round. Regardless of the recoil, I’ll stick to my .40 by Smith & Wesson. I personally feel it is a great handgun. Hate to be a spoilsport here, but you have a spelling error in talking about these SIG pistols. The word “trails” is used in talking about the competition between weapons for purchase by the armed forces. The correct word is, “TRIALS” not, “TRAILS”. Trials is used to describe the competitive evaluation of a new pistol prior to acceptance and/or purchase for use by the Armed Forces. Trails refers to the paths that go through the forests, that are used by animals and people, NOT that firearms take. Don’t forget my wife’s little P232 in .380, it’s a great little pistol. It just keeps shooting and shooting, no jams or hangups or misfires. Sig pitols are AMAZING! I have a 226 MK25 thats almost 3 years old, with just a touch over 6000 (yes 6k) rounds through it, ZERO malfuncions to date!!! I sold off my 1911 collection in favor of Sig P Series pistols. 226 mk 25, 227, 220, and225. Why?? Why did you sell your 1911 collection? I give it to the P220 W.Germany made single stack 45 ACP (8rds + 1rd ) 9rds that is enough for me, you give up slim fit with a 10 -12- 13 think about it 9 rds a p227 -11 rds two rounds advantage or HK 4 rds Glock 5 rd. I really don’t like a thick pistol or that extra weight of the extra rounds . In most cases 8 or 9 rounds will handle most circustances you run into other than a full all out war. I love the size, the power, feel of the P220. Sig all the way…I own a few with my favorite being a toss up… p220 scorpion elite p226 legion p225a1 p238. I’ve got quite a few rounds through each. They all obviously have a similar feel considering the platform is identical with exception to the grip size and I must say I carry based upon which one fits better for the day. They all have been 100% reliable with accuracy rivaled by a custom 1911 Springfield I’ve fired. Da/sa is the only way I’ll carry these days. My wife my son and I all depend on these and I’d rest my life on any one of these fine sigs. Why just get by with something that works when you can do it in style? Sure glocks work, m&ps work, heck I’m actually a fan of xds but you can just double the price and buy a legion or an elite Sig and actually take pride in your hardware. It will certainly be passed down through my family. They are fun to shoot both comfortable and accurate yet sturdy enough you can still count your life on it when SHTF. I would think the P232 would be in the top 5 Sigs also — i LOVE mine! I own all3 Legions a 226 Elite ,MK25, and a scorpion1911. and a 226 Scorpion plus 2 238’s and a 938, all worth every penny(and there quite a few )but solid performers right out of the box. Hats off to the Springfield TCP Operator as well, I feel really well armed without having to alter any of them , I shoot every day and carry is always a tough decision ,but you can’t go wrong with Sig as far as I’m concerned. Too many excellent guns on the marked these are just my favorites. Can’t end without commenting on Sig Customer service, they are on it!!! !